This is a recipe for Batata Vada. 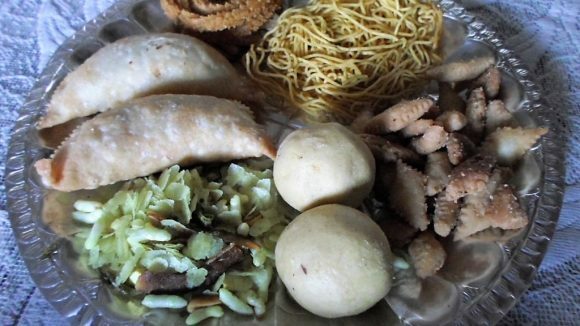 This is traditional dish from Maharashtra. It is very delicious and popular dish, normally taken for breakfast or as an afternoon snack or for Kitty Parties and Birthday Parties. First boiled the Potatoes remove the skin of the Potatoes & smash or cur in small pieces put Salt, sugar & Lemon Juice mix it nicely. Grind the Coriander, Green Chili, Garlic & Ginger. Heat 2 Table spoon Oil in frying pan add Rai, Jeera, Hing , Kadipatta, Onion, and add the ground Coriander, Green Chili, Garlic & Ginger.and Turmeric and fry for 8-10 minutes on slow sim. After that add potatoes and fry for 5 minutes on slow sim when it will get cold then make small balls. Take one cup of Besan add Salt, Turmeric, Red Chili powder, two table spoon hot Oil mix it nicely then add water & 1 pinch cooking Soda powder make a thick paste, dip the Vadas one by one in that paste. Heat the Oil in one Kadhai & deep fry the Vadas till the colour change to Pink. Serve with Sauce.